Definition at line 554 of file lltexlayer.h. Definition at line 564 of file lltexlayer.h. Definition at line 557 of file lltexlayer.h. Definition at line 2599 of file lltexlayer.cpp. Definition at line 2610 of file lltexlayer.cpp. References f, i, llfloor(), mPaletteMap, and S32. Definition at line 2646 of file lltexlayer.cpp. 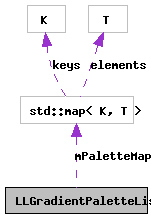 References f, llendl, llfloor(), llwarns, mPaletteMap, and set_palette(). Definition at line 565 of file lltexlayer.h. Referenced by initPalette(), setHardwarePalette(), and ~LLGradientPaletteList().